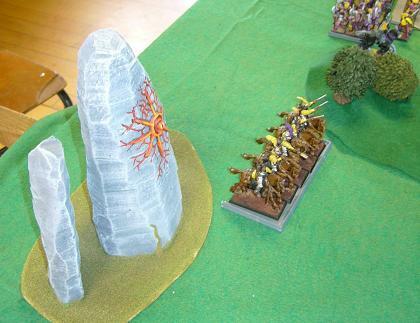 All ancients games today - two DBMM and one FoG. Field of Glory 15mm - Rob's Byzantines beat Philip's Pontic army. Our first FoG game for quite a while, but we picked it up pretty easily. The game was largely decided by the cavalry clash, with the infantry contributing little to the combat other than some longer range archery and skirmishing. DBMM 15mm - Al (Spartans) won 16-9 over Kendall (Normans). In the picture here you can see the nearer hill occupied by the Spartan light troops. In front of the rough ground the Spartan hoplites are fighting the Norman knights and blades. To their rear is the Spartan baggage being sacked by a Norman flank march. A close fight, decided when the Norman general rolled an untimely 1 in combat. Rob (Warriors of Chaos) versus Garth (Warriors of Chaos)- winning draw to Garth. Flames of War (Late War, encounter game) Ken's Panzer Pioneers defeated Kendall's Panzer Grenadiers. Flames of War - Ken (Germans) and Rob (British) had a massive late war game. In a Flames of War fighting withdrawal scenario, Kit's Russians got a narrow 4-3 victory over Ken's Germans. Most of us were away for the weekend to other conventions (Flames GT in Auckland and the New Plymouth 25mm ancients tournament). At the club today Kendall and Matt were using the Tumbling Dice aircraft models. There were five NSWC players out of the 42 at the Late War NZGT. Lee used US 2nd Armored Division. He got best general and came 6th overall, and also won the contest for guessing how many bits of models put in a jar! Rob used British Para armoured reece, and came 15th. Ken came 25th and used the panzer pioneers. Tristan was 27th and used Panzer Pioneer as well. Not too bad from NSWC. 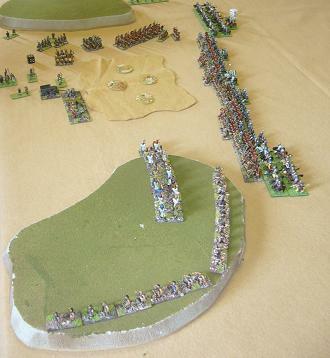 The were lots of Flames of War training games on today, as the Grand Tournament is on in a couple of weeks. 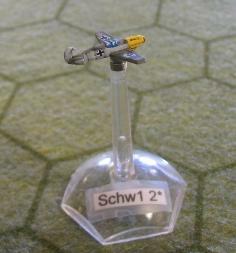 There were also two more games from the DBMM competition, both in 25mm. Several games happening today as part of the regular club meeting, as well as the second day of PoP. Mark and Nick played Warhammer Fantasy Battle; Brett and Kit played Flames of War; and Lee and Robert also played Flames of War. Congratulations to John for his win, and thanks to everyone for a most enjoyable tournament! Kendall and Kit played a Flames of War game. Kendall's newly assembled and unpainted [shame] 155mm SP artillery helped the American cause, but not enough to stop the German panzer force. The last game of Round Three in the DBMM competition was between Andrew and Lawrence, using 15mm armies (Hittites and Assyrians). Lawrence won a 25-0 victory (interestingly enough, the third 25-0 result of round three). The draw for Round Four has now been done, and we have also played the first of the games today: Brett (Medieval Germans) winning 23-2 over Philip (Kushite Egyptians). Just the one game today. WFB: Rob (Orcs and hordes of Hobgoblins) lost to Antony (Dark Elves). Matt, Philip and Rob played a couple of games of Carcasson Hunters and Gatherers. 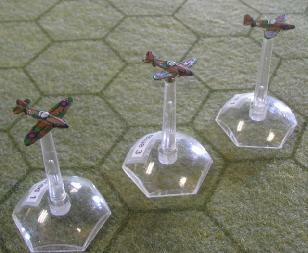 We had a couple of DBR 25mm games at the club today. Lawrence's German Catholic Imperial army defeated Scott's Later Poles (pictured here). The Germans got off to a slow start with low pips, but once deployed their infantry and cavalry formations were able to wear down the hard fighting superior shot of the Poles. Philip's Early Tudor English beat Andrew's Tripolitanians 9-1. The Tripolitanians were defending and placed a BUA and large scrubby area for their warbands to advance through. Some made it into the English baggage, but eventually the the English billmen, longbows and lancers inflicted enough casualties to get the win. The game was 450AP, giving the Tripolitanians a great mass of warbands, sipahis and light horse, and the English had an allied contingent from the Maximilian imperialists. Just the one game at the club meeting today, another one from the DBMM competition. Benny's new Marian Roman army was fielded for the first time, but suffered a 25-0 defeat by Philip's old Kushite Egyptians. Again the battle was decided by a flank march getting into the baggage. 24 July 2008. The second round of the DBMM competition has been completed, with a win to Brett (Samurai) over Al (Spartans). One other non-comp game at the club today was also a DBMM 25mm medieval game - Brett's Germans vs Rob's Portuguese.